The pattern was inspired by "Plain Folk" from the Simple Whatnots Club-3 by Kim Diehl. The block starts with a pinwheel center made using Thangles and uses 2 1/2" strips for the Steps in the Courthouse. The finished block is approx 20" (20 1/2" unfinished). The kit includes all the fabric for the top, the pattern and the Thangles to make the Pinwheel centers. We've included 24 different homespuns that measure 26' (long) x 22" wide - allowing you to cut on the lengthwise grain (parallel to the selvage) to eliminate strip distortion. You will easily get 12 blocks from the bundle to create a cozy quilt that measures 60" x 80" (approx). Dig into your stash and you can make additional blocks for a larger quilt. 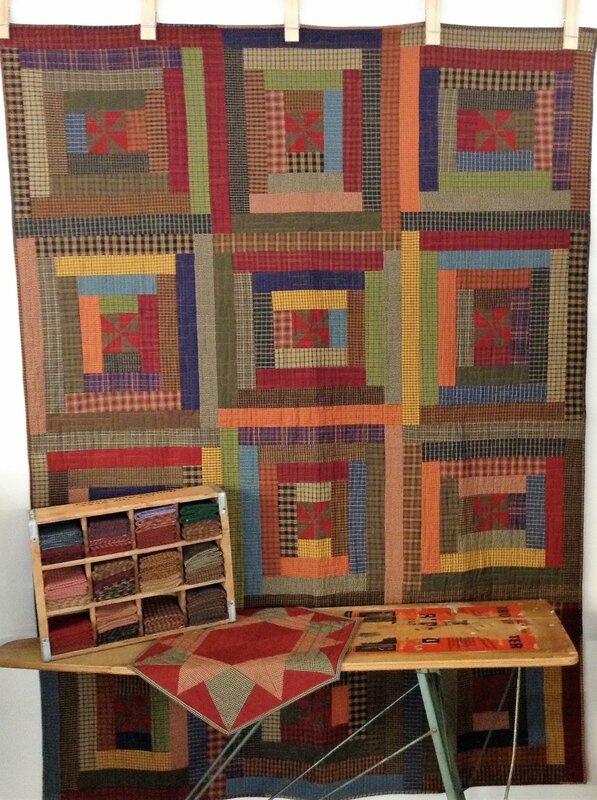 As a bonus we will include the Simple Whatnots pattern "Plain Folk"
Kit does not include the binding or the backing.